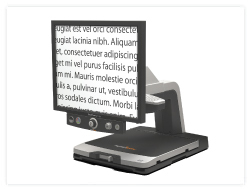 The portable capture station is used with the Reader to quickly and conveniently capture large amounts of text. The sturdy, portable stand enables complete, rapid text capture.The base has a transparent film that the user can stretch over the reading material to hold it flat for accurate recording. The large, easy-to-find capture button on the base of the station makes the process fast and easy.The station folds up into a convenient briefcase size for use at home, work or school.Note: This item is non-returnable except for damage occuring in transit or technical defects.